Poly - Tarps Direct's Poly round tarps are made from heavy duty 6 ounce Silver/Black or Silver/White polyethylene that has a weave count of 14 x 14 with a thickness of 11-12 mil. 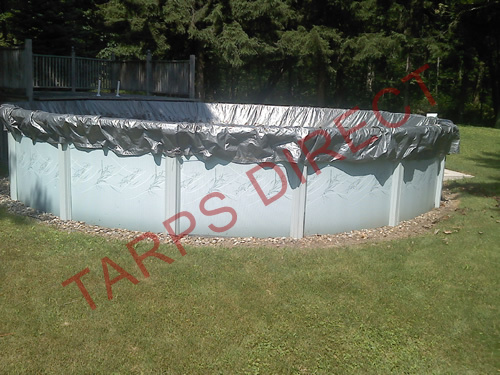 The Silver/Black tarps provides excellent UV protection and blocks sunlight from getting through which is especially helpful in swimming pool applications. The Silver/White combination is better for applications where it is used to cover a grass surface. 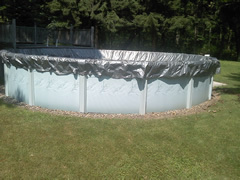 Besides offering UV protection the round tarp is also waterproof and mildew resistant. Double grommets - three inches apart - are provided approximately every 24 inches apart around the circumference of the tarp. Please call if you require a size that is not listed. Normally ships within 7-10 days. Note: Poly tarps are listed as a cut size – finish size is 3% to 5% smaller. Sizes listed are diameter. Note: VCP tarps are listed as a cut size – finish size is 3% to 5% smaller. Sizes listed are diameter. Tarps Direct offers round tarps in numerous sizes in both Poly (polyethylene) as well as Vinyl. Round tarps are easier to use in certain applications than their rectangular/square counterparts. If you are trying to cover a baseball/softball pitching mound, bases or home plate area; the round tarp is what is needed. Swimming pools, spas, fire pits and round outdoor furniture are all good applications for the round tarp to cover and protect. Whether you choose Poly or Vinyl; both are very durable. Grommets all around the circumference allow for easy tying down. Round tarps manufactured from either material are waterproof and mildew resistant.